Horse slaughter is not a "necessary evil", merely an evil. Now is our opportunity to resign this practice to the dust bin of American history. At the moment, the news is rife with stories about the level of equine neglect in the United States, with many of the articles blaming the "unintended consequences" of closing the US horse slaughter plants and calling for them to be reopened. But in reality, we are coming up on a once in a lifetime opportunity to get rid of this abominable practice once and for all. To understand this apparent paradox, one needs to get past unsubstantiated myths to the real forces at play in the market. First, one needs to understand that it is completely impossible to blame the current glut of excess horses on the closing of the slaughter plants because the closings simply sent the horses over the Mexican and Canadian borders for slaughter. In 2006, the year before the closings, 142,740 American horses were slaughtered, and that number only dropped by 14% the year the plants were closed. By 2008, slaughter was back to the second highest level in almost ten years. Next, it is necessary to understand what really causes neglect, and that is unemployment. After years of studying the relationship between neglect rates and slaughter volumes, I had concluded that there was no relationship whatever. 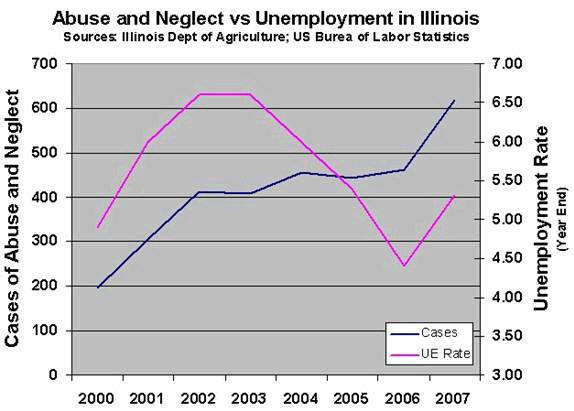 Then I looked at the rates of neglect in Illinois in comparison with unemployment in the state. The correlation was striking. Like most such revelations, it should have been expected, but it was still striking. It perfectly explains the mystery of how the number of American horses slaughtered in the US between 1989 and 2002 could have dropped from 377,078 to 77,713 (almost 80%) with no negative impact on either neglect or horse prices. This correlation also tells us what we can expect as unemployment goes both up and down. At the moment the US is experiencing high unemployment with national rates hovering just under 10%. As predicted from the above graph, this is causing a high rate of neglect. So why can I say with complete confidence that we are coming up on the perfect opportunity to end slaughter without significantly impacting the horse market? There is a second factor at work. As the market for horses remains depressed, many breeders are throwing in the proverbial towel. Every day brood mares and stallions are being sold at auction and on internet sites like Craig's List. This is temporarily increasing the supply and further depressing prices. The result of this further depression in prices is to convince even more breeders to quit producing. Statistics show breeding is down dramatically in virtually all breeds. The Jockey Club, for example, recently predicted the 2011 foal crop will be the lowest since 1973. Similarly, the American Quarter Horse Association's annual reports shows a 15% drop in revenue for new registrations between 2006 and 2009. This trend will continue until the economy begins to recover significantly, or the market eventually reaches a new balance. Slaughter cannot help reduce the over supply of horses because the horse meat market is also depressed. Although the export of US slaughter horses in 2008 brought the annual slaughter back its level before the plant closures, the subsequent recession caused a 25.8% drop in exports between 2008 and 2009. The reduction in demand for slaughter horses will likely continue as the effects of new EU drug residue regulations begin forcing horses to be quarantined for 6 months prior to slaughter. But these two trends are about to merge and provide a wonderful opportunity to end slaughter with little or no impact on the market. As the smaller foal crops reach market age, there will be a reduction supply, and when the economy finally begins to recover, it will bring with it more carrying capacity (demand) for horses. With less supply and more homes available, the number of surplus horses will dip to a record low. Moreover, there will be a move toward quality. In a recent interview, a struggling breeder in Canada complained she had to sell her horses to slaughter because the market was so low, but in the very next sentence she explained "You have to breed 100 horses to get two good ones." Clearly that business model has been a big part of the problem that gotten us to this point, but few "lotto breeders" appear to be surviving the current market. Only a deep and prolonged recession could have brought us this opportunity and we have certainly been experiencing just that. It would be a tremendous shame if we missed this coming opportunity. Recent auction reports indicate that prices are already beginning to increase. What is needed is for Congress to pass HR 503 / S 727, banning the slaughter and export to slaughter of American horses. This action could be placed in abeyance until a trigger was reached of unemployment dropping significantly (perhaps under 8%). The result would be a smooth transition to a much more humane equine industry. John Holland is a freelance writer, the author of three books and an industrial consultant in the field of intelligent automation and knowledge engineering. He frequently writes on the subject of horse slaughter from his small farm in the mountains of Virginia, where he lives with his wife, Sheilah, and their 12 equines. Holland is president of the Equine Welfare Alliance and serves as senior analyst for Americans Against Horse Slaughter, an organization composed entirely of volunteers.